“Since the movement of some destitutes from Lagos to Onitsha in Anambra State to re-unite with their families as requested, many have decided to play politics with it. Many have called it deportation, some called it descent to Nazism, some gave it ethnic colouration while some said it is the story of Nigerians made ‘illegal aliens’ in their country. “The truth of the matter is that Lagos has said that it will not accept a situation where people enter buses from Sokoto, Ibadan or Onitsha or Aba to come to Lagos to beg and in the night sleep under the bridges and roads sides and thereby constituting danger to themselves and to the society at large. Some women among them have been raped or sexually abused. Some of them have been recruited into armed robbery and some other gangs. Some have been used for ritual purposes. Some have been killed and dumped. “Most of these people are picked up mentally retarded, terribly abused, sexually dehumanized, hungry, weak, and memory lost. What Lagos does is to pick them up and take them to rehabilitation centres. There, they are rehabilitated, until they are strong enough to talk and give account of themselves. Some of them after recovery may decide to engage themselves by joining skill acquisition centres we have all over Lagos, some may decide to join their kits and kins in their States of origin. After interrogations and investigations those willing to go are taken to a central place close to their towns to find their way. They are provided with logistics for that. Even though they may not admit it just to get sympathy and attention. “The so-called Onitsha deportation is not the first time this has been done. Lagos has taken destitutes to Oyo, Osun and some States in the North in the past. Lagos has gone to Akwa Ibom recently to pick her destitutes too. “Before moving these destitute to Onitsha, Lagos State Government wrote to Anambra State Government on the matter and there was no reply until the State decided to move them to Onitsha. Now the political jobbers call this deportation. Lagos does not deport people. Lagos is the home of all Nigerians. But Lagos frowns at people who come to Lagos to become a threat to security of lives and property. It borders on security issues. “Millions of Ndigbo living in Lagos are critical stakeholders in the State. They control all the markets. They control commerce. 80% of rich South Easterners made their fortunes in Lagos. They are in transport, commerce, engineering, oil & gas, construction, estate, banking and finance, artisans etc. Now, tell me how Lagos has been deporting other Nigerians. Are we saying that Lagos has brought 1000 Luxurious Buses and moved from street to street, forcefully ejecting Igbo people from their houses packed them inside buses and moved to the East? A school of thought has said that there should be a balance between citizens’ rights and confronting security challenges. Lagos does not indulge in irresponsible, dishonest and unquestionable activities. Decisions are taken in the overall interest of Lagosians, Ndigbo inclusive. It is all about security. "Lagos is the only State in Nigeria where almost every graduate heads to after graduation, it is a place to be in terms of anything business, it is the commercial hub of Nigeria, the ‘heads’ of all Nigerians and city you can call your own if you abide by the rules. It is the economic nerve-centre of Nigeria. Lagos is the pride of Nigeria. “The Governor of Lagos State is an exceptional governor, a detribalized Nigerian, a Senior Advocate of Nigeria (SAN) who is level-headed, disciplined and lettered. He does not engage in meaningless and frivolous things. He understands the strength, of diversity and plurality in a State like Lagos. He knows also that all ethnic nationalities drive the economy of Lagos. He cannot toy with the destiny of Lagos. “Politics of 2015 is fast approaching. I know that ethnic chance takers, political opportunists and the rudderless opposition in Lagos have been taking advantage of the so-called Onitsha deportation to score cheap political points. No, it can never happen. We have to set the records straight. Boko Haram is a security challenge in Lagos as well as the whole of Nigeria. People say Lagos is the safest State in Nigeria. Yes, I agree but remember Lagos has achieved this as a result of activities, taking hard, drastic and tough decisions, within the rules of engagements and rules of law to get things done. •Photo shows Engr. Joe Igbokwe. 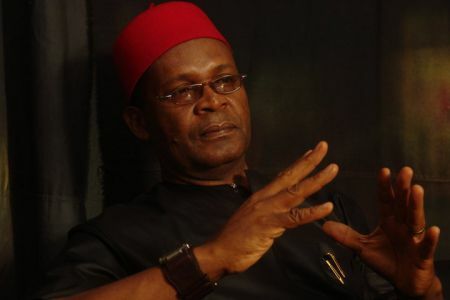 Chief Joe Igbokwe is a 'massa'. A massa in the days of slavery in the Americas was a black slave who was made to oversee fellow slaves on behalf of the white slave owner. He is usually more cruel than the white owners and goes out of his way to inflict excess punishment on his kind in other to curry the favour of his master. That is exactly what the spirited defence of the disgraceful deportation and dumping of fellow Igbo by Lagos fascists amounts to. The shameless igbo renegade claims that LASG wrote to Anambra State for what? To tell us that you would be dumping our people at the dead of the night like heaps of rubbish? Unthinking idiot! So, how come you dropped non-Anmabrarians? Come to Nnewi and make this explanation, Chief Igbokwe! I don't really understand how people rationalize somethings…LASG doesn't have the right to force anybody out of the state…what is the rationale for dumping them at Upper Iweka in the middle of the night? So their "Igbo brothers" can take care of them? If that's not extreme tribalism, I wonder what is…anyway, as long as Lagos is part of the FGN, has FG infrastructure, and enjoys monthly oil money distribution, buses will keep loading from Upper Iweka and bridgehead everyday…there's nothing Joe Igbokwe and his people can do about that. Joe Igbokwe…my only worry is his surname, Igbokwe. However, he missed the point. Did I hear him say that Lagos went to Akwa Ibom to pick her destitutes? Liar. Lagos State does not have any destitute anywhere, if there is, certainly not in Akwa Ibom, where the government of Akpabio has given free education children in the state not minding their states of origin.